The incidence of child labour is inextricably linked to the denial of decent working conditions for adults. A parent enjoying decent working conditions, including a living wage, is less likely to send children to work to contribute to family income than a worker whose fundamental rights are violated. “Decent working conditions should also include access to pension schemes,” said Mr Andrews Addoquaye Tagoe, Head of Programmes, Training and Education, General Agricultural Workers’ Union (GAWU) of Ghana, and Regional Coordinator for Anglophone Africa of Global March Against Child Labour. Ghana has developed a National Action Plan (NAP) to eliminate worst forms of child labour by 2015. Mr Tagoe explained that implementing the NAP and ensuring respect for other international conventions ratified by Ghana should place the welfare of farmers, including access to pension rights, at centre stage to strengthen impact. He pointed out that the situation for farmers should be the same as it is for workers in the formal employment sector and they should be able to benefit from a pension scheme so that their children could go to school and benefit from the same future employment opportunities as other children. “There is no reason why farmers should not have the same benefits as their counterparts in the formal sector,” said Mr Tagoe. “They are also workers and pay tax like any other person in the formal employment sector.” In addition, farmers support the national economy by producing cocoa and GAWU believes, therefore, that the government should support a pension scheme for cocoa farmers. Although the government announced the establishment of a pension scheme to cater for the welfare of farmers in their old age in 2009, it has yet to get up and running. Deputy Minister of Employment and Social Welfare Antwi Boasiako-Sekyere points out that the new three-tier pension scheme should encourage the informal sector to save for the future. It is understood that the Ghana Cocoa Board (COCOBOD) is working on the first ever pension scheme for cocoa farmers and an interim report has been submitted to its Board. COCOBOD Monitoring and Evaluation Director, Ebenezer Tei Quartey, is hopeful that over 800,000 cocoa farmers in the country will be on the pension scheme from early 2012. Ever since it ratified the International Labour Organization’s child labour conventions in recent years, the government has been seeking to address the issue of child labour in the cocoa sector, particularly given the importance of this sector in the national economy. Agriculture is the mainstay of the rural economy in Ghana and a survey by the Ghana Statistical Service in 2003 highlighted the levels of child labour in this sector. Rural children and young people are also more economically active at younger ages than other children in Ghana. The sector also came under close scrutiny by the international media since evidence emerged in 2001 of child exploitation in the cocoa industry in Ghana. Under pressure of consumer boycotts of chocolate products and some western countries threatening to cease purchasing coca from Ghana as a result, the government realised that strong interventions were required and sought support from the international community to tackle the issue of child labour in coca-production. Two projects were recently launched in Accra to eliminate worst forms of child labour in cocoa-growing communities in Ghana and Ivory Coast. 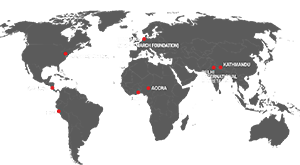 In addition, the International Cocoa Initiative (ICI), a global multi-stakeholder group bringing together industry and non-industry actors in the cocoa sector to address child labour including Global March which sits on the Board, has been implementing programmes since 2002 in both Ghana and Ivory Coast.